Homemade gifts are fine if the home to which they are being given happens to be designed to accept the design of others. Case in point, the beautifully crafted quilt which has it’s origin in a history that has nothing to do with the Eames chair,the Corbusier couch…but a birdhouse, which is created to house a creature of nature, somehow fits into any place, softens any hard lines, warms any cool corner. A birdhouse, even an empty one, offers hope of new life and that in and of itself, to me, is warm and happy and wonderful. Your birdhouse against the blue sky makes me happy as I wait for some new winged thing to come, choose a place in a garden of a yard by a house that I myself chose 29 years ago for you to live and grow and learn to become the artist, the writer, the musician, the thinker that you have become. I appreciate our birdhouse and loved the time playing with your children while you painted in the garden in the back. Man, I was right there in the garden beside you, painting, as I read your post above. I couldn’t wait to get down to the birdhouse. Great job, and congratulations on entering the sanctuary of plein air! I only started that about four years ago, and wish I had begun earlier. The weather in Texas is finally favoring plein air activity, and I did my first one on Good Friday. 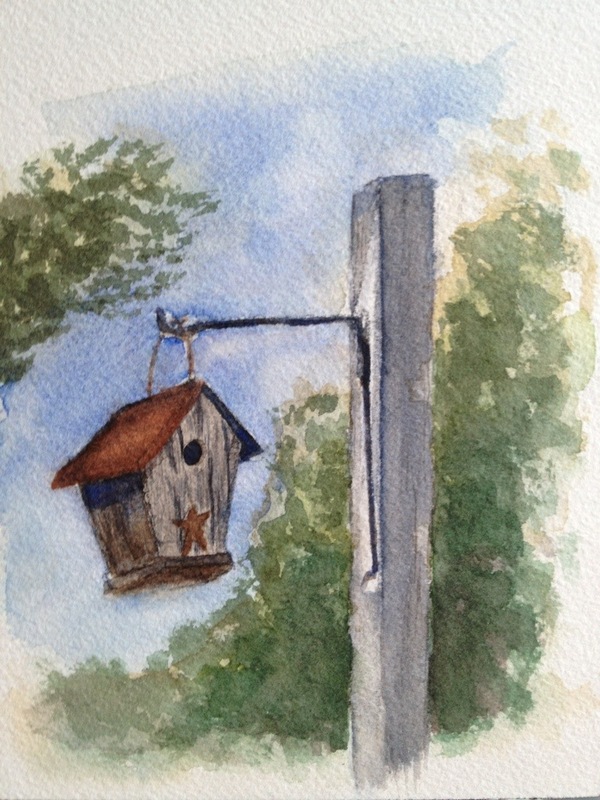 I have never painted a birdhouse, and now want to. Imagism grips me again (no ideas but in things) as I wonder what it is about a birdhouse that I find so inviting and so soothing to behold. I love your writing too. Thank you for putting this out here for us to read and enjoy.